Today, I write to you as a pissed-off consumer. Actually, every day I write to you I’m a pissed-off consumer, because I have Comcast. But today, I’m especially pissed off about something else: official-looking warranty expiration notices. Have you ever gotten one of these? I’ve owned a lot of cars over the years, so I get them fairly often, and they’re just some of the most shady-looking documents you’ll ever get in your entire life. 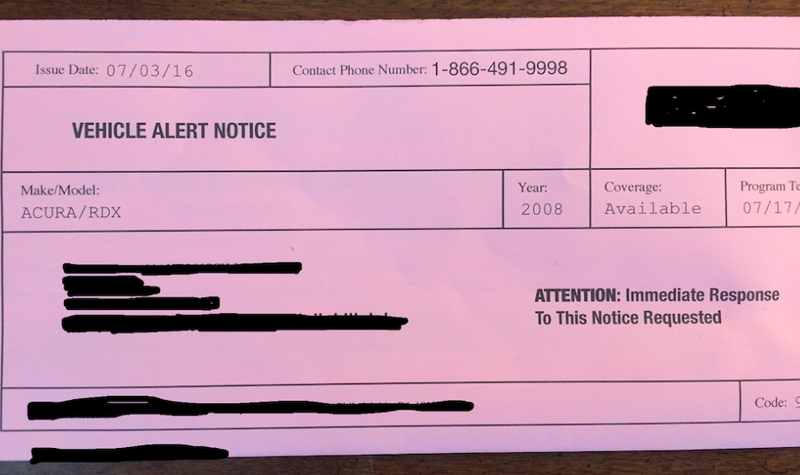 So I anxiously open this letter, and it turns out to be from some company called “EXTENDED WARRANTY AMERICA” or “WARRANTY CONTRACT SERVICES” or “JIM BOB’S WARRANTIES AND VAPING SUPPLIES.” And it turns out the “VEHICLE ALERT” is really just that they think the warranty is expiring on a 2007 Volkswagen GTI that I owned half a decade ago before I sold it to a couple who lives in Nevada, and so they want to sell me an extended warranty to supplement it. So basically, this VEHICLE ALERT wasn’t an alert at all, except that it alerted me to the fact that WARRANTY CONTRACT SERVICES is the kind of company that earmarks a quarter of its annual budget for paying Yelp to remove bad reviews. I know to discard these notices, but they’re more effective than you might think. About two weeks ago, my fiancée and I were talking, and she told me that she had gotten an official letter about her warranty expiring, and she had to call to make sure she was still covered. She drives a 2008 Acura RDX, the turbocharged one, which is currently parked while we wait for Acura to replace our Death Airbag. So this piqued my interest, and I looked over the letter, and sure enough, it was from an extended warranty company. VEHICLE ALERT NOTICE. ATTENTION: Immediate Response To This Notice Requested. They even printed a “response deadline,” as if they would not desperately sell her an extended warranty for any vehicle, at any moment, even if she was driving a 1987 Lincoln Town Car and she called at noon on Christmas. Now, I suspect my fiancée wouldn’t have fallen for this company’s sales pitch once she called them, but the point is that the letter convinced her to call them. And she is not a stupid person. She was her high school valedictorian, for God’s sake. Do you know how far away I was from being my high school valedictorian? My high school valedictorian went to Yale and is currently in medical school. I’m sitting in my bedroom eating Doritos and writing about mail I get. That’s how far. So anyway: let’s say she called them and didn’t fall for their sales pitch. Think of all the people who would fall for it. I want you to imagine older people, in their twilight years, driving around in some older person car, such as a Buick Lucerne, and they get this note in the mail. You know what they’re going to do? They’re going to be terrified, and they’re going to call up this place, and they’re going to buy the best possible coverage, which involves an extended powertrain warranty, and an extended interior warranty, and an extended trunk liner warranty, and an extended warranty that covers the car in case of lightning strike or intravenous drug use. So basically, what I am saying here is that these extended warranty notices are ridiculous, and predatory, and they should probably be stopped immediately so they do not swindle any further people out of their money. Meanwhile, if you actually do want an extended warranty, you should be free to pursue this at your own desire. Just call up Jim Bob’s and get a free vape pen with every three-year warranty purchase.